Deputy Director, r/s Major-General Nikolay Grigoryan visited the educational program web platform- Dasaran.am. 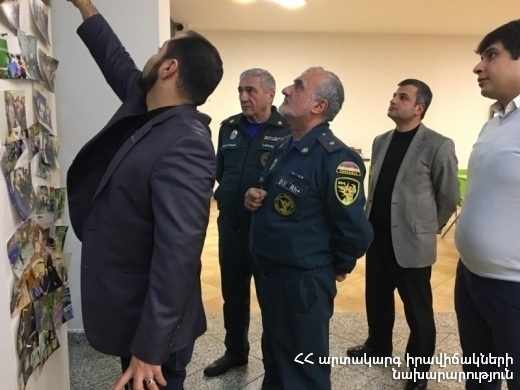 In accordance with the Emergency Situations Minister Davit Tonoyan’s instruction, ie., to collaborate with Dasaran.am web platform, for developing educational electronic materials and games teaching and promoting the safety rules for children. The possible ways of cooperation were discussed with representatives of the educational program, which aimed at developing and strengthening safety culture, rules of conduct in emergency situations among teaching staff and students. A tour was organized at the educational centre, during which the representatives of the Ministry got acquainted with the activities of “Dasaran”, the educational platform provided by the program and its possibilities. Having a primary goal- to make education accessible to all, regardless of social status and geographical location, to provide alternative learning opportunities, secure telecommunications platform for Armenian students of Armenia, Artsakh and the Diaspora. The Ministry of Emergency Situations will support Dasaran in the developing and sharing knowledge, abilities, skills in the field of disaster risk reduction.